A bundle of synths, samplers, drums and effects; you've never had it so good! An enormous amount in one very affordable and Komplete package. Well done NI. Huge amount of content. Great price. Welcome updates to current favourites. At this price, we definitely have no complaints. A more than impressive bundle of goodies. The new Guitar Rig Player includes the library and can be downloaded for free. Traktor Pro's effects are now available in Guitar Rig for use in your productions. 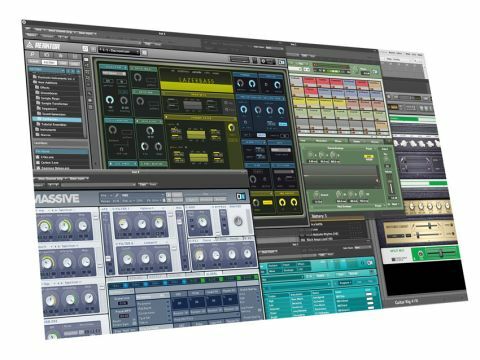 Take a look at the list of individual software titles currently available from Native Instruments and it's not really stretching the truth to suggest that many would make it into a Who's Who of contemporary production tools. Think first of synth powerhouses like Massive or the DX-clone FM8, which both provide killer sounds out of the box but which also reward those with an appetite for sound-building as much as any other synth available today. "Komplete 7 provides such a powerful solution to modern music production as to prove inspiring." Or, switch focus to the more 'out there' titles such as Reaktor, the seminal modular synthesizer once described as being capable of producing any sound you could think of, or the mercurial Absynth 5, with its collection of evolving soundscapes, flexible breakpoint envelopes and phenomenal internal effects. Then consider Kontakt, which is now established as the most popular sampler through which third-party manufacturers are bringing their new libraries to market, to say nothing of the increasingly huge native library NI are building for it themselves. As far as beat-making is concerned, there's the evergreen Battery 3, which has a staggering number of musical genres covered through its library and again, rather than simply providing collections of drum hits, the interface through which sounds can be manipulated rewards invention. Oh, and did we forget to mention effects processors such as Guitar Rig, which is swiftly morphing from being simply one of the most popular guitar amp simulation plug-ins into a host for all sorts of effects-based jiggery pokery? So, what if we were to tell you that NI's new 'Komplete' bundle, now at Version 7, offers all of these titles, plus many more for less than 500 Euros to new users and much less to upgraders? Yes, something told us you might want to read on. Despite the impressive summary above, the titles listed represent only a few of the Komplete 7 pie, which actually comprises 24 separate instruments, libraries and effects collections. While Komplete bundles have been offered before, it's fair to say that in terms of value for money, this one blows its predecessors away as the total cost of buying the individual titles within this bundle would represent an outlay several times greater than buying Komplete 7 itself. Compared with Komplete 6, version 7 provides 17 additional 'packages', provides 3,000 more sounds (the total is now 10,000), provides an additional 30GB of sample data (a total now of 90GB) and, in case you needed any further convincing, even bundles a 50 Euro e-voucher which you can put towards any purchase you fancy from NI's online store. Needless to say, you'll need to carry out some serious installation before you're up and running but NI's Service Centre makes activation of software libraries very easy and, for newbies, this application is the place to which you'll return each time any of the titles within your collection requires updating. Komplete 7 offers a staggering 24 software titles compared to its predecessor's seven, so here's a full list of what's included. In terms of synths and drum machines, you get Absynth 5, Battery 3, FM8, Massive and Reaktor 5.5, with the latter benefiting from the new Reaktor Prism instrument, Reaktor Spark and Tim Exile's The Finger effect. Then there's the full version of Kontakt 4, with the following bundled libraries: Abbey Road 60s Drums, Berlin Concert Grand, New York Concert Grand, Scarbee A-200, Scarbee Mark 1, Scarbee MM-Bass, Upright Piano, Vienna Concert Grand and Vintage Organs. Then comes Guitar Rig Pro 4, with new effects suites Traktor's 12, Rammfire and Reflektor. Lastly, for the free Kore Player, you'll find the Acoustic Refractions collection. Kontakt 4 costs 379 Euros as a standalone title, while Battery 3 costs 179 Euros. So, if you're wondering about value for money, you could buy Komplete 7, gain those two titles plus 22 others and save 59 Euros as well as receiving a voucher worth 49 Euros to spend on yet another NI library title on their website. The world's gone mad. Looking first at Guitar Rig 4 Pro, the new effects collections are very welcome. The first of these, Rammfire, is a powerful guitar plug-in developed in collaboration with Richard Z. Kruspe of Rammstein. It models his Pre-500 Dual Rectifier Amp and is particularly effective on lead sounds which need to come right to the front of your mixes. Beyond guitar effects, Reflektor is a new convolution reverb which NI has developed with a good collection of impulse responses. Reflektor goes beyond the limitations of some convolution reverbs by allowing manipulation of the envelope shape of its reverb via its large Decay dial, while the size dial allows reverbs to get longer as well as shorter. If you're increasing size, the loaded IR is analysed and effectively reconfigured in real-time to produce longer versions of itself. Impressively, all of this happens with super-low latency times, which in turn reduces CPU load. Lastly, there's Traktor's 12, a bundle of a dozen effects lifted from Traktor which you're free to configure within Guitar Rig 4. These are: Beat Slicer, Beatmasher, Digital LoFi, Formant Filter, Gater, Mulholland Drive, Peak Filter, Reverse Grain, Ring Mod, Traktor Delay, Traktor Reverb and Transpose Stretch. They're designed to be simple to use but, despite deliberately pared down parameter sets, are capable of great things. Kontakt is the single biggest beneficiary to Komplete 7, with an impressive collection of previously separate titles offered within the new bundle. These include Abbey Road's '60s Drums, pianos aplenty in the form of Berlin, New York and Vienna Concert Grands alongside a more humble Upright model, the Scarbee A-200 and Mark I electric pianos, Clavinet/Pianet and MM-Bass libraries and, our personal favourite, the new Vintage Organ library. The latter can be consider the successor to the now defunct B4 instrument cast aside by NI a few years ago, with this new Kontakt collection a really sumptuous set of instruments which are ready to slot into a range of musical styles. The pianos are worthy of note too - each library runs to a few GBs and, as such, each features nicely multi-sampled pianos which will blend easily into film/TV composition work, as well as Pop and Dance productions. Perhaps the biggest surprise of the Komplete 7 package was the near simultaneous update to Reaktor in the form of version 5.5, with a new GUI, unprecedented improvements to its ease of use and brand new content in the form of the powerful Prism. Notably, the arrival of Komplete 7 coincides with NI Players for both Reaktor and Guitar Rig in the vein of the popular Kontakt Player. These can both be downloaded for free (with their own native libraries) and can be expanded with appropriate content from NI's shop. Komplete 7 is a staggering package, no matter how you want to look at it. If you're a brand new user, for 499 Euros, you get 24 software titles that could genuinely represent the only bundle you'll ever need to buy in order to make music in any genre you care to mention. Without question, Komplete 7 represents phenomenal value for money but for us, it's as much about how the content is accessed, with Kontakt, Guitar Rig and increasingly Reaktor coming to the fore as host titles for the libraries they support, alongside dedicated GUIs for the more sophisticated synth and drum titles. While Komplete 7 doesn't herald the arrival of a flagship new synth to rival Massive or Absynth 5, what it does is to provide such a powerful solution to modern music production as to prove truly inspiring. Komplete by name and complete by nature.